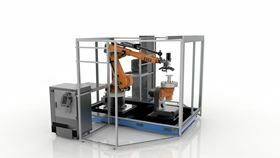 Stratasys Robotic Composite 3D Demonstrator unveils a hybrid approach for automated composite part production that enables the full value of additive manufacturing to be applied. Photo courtesy Stratasys. Stratasys Ltd and Siemens have made a formal partnership to help incorporate additive manufacturing (AM) into the traditional manufacturing workflow. The company want to help AM become a universally recognized production practice which can benefit multiple industries, including aerospace, automotive, transportation, energy and industrial tooling. Stratasys and Siemens have been collaborating on multiple projects including the direct link from Siemens’ NX software for CAD/CAM/CAE to Stratasys’ GrabCAD Print platform – enabling a design-to-3D print workflow – and the recently previewed Stratasys Robotic Composite 3D Demonstrator that incorporates Siemens’ product lifecycle management (PLM) software and its motion control and CNC automation technologies. This story is reprinted from material from Siemens, with editorial changes made by Materials Today. The views expressed in this article do not necessarily represent those of Elsevier. Siemens has acquired a majority stake (85%) in Materials Solutions Ltd, a specialist in AM processing and production. AM specialist Stratasys has reported revenue of US$167.9 million for Q1 2016, compared to US$172.7 million in the same period last year.